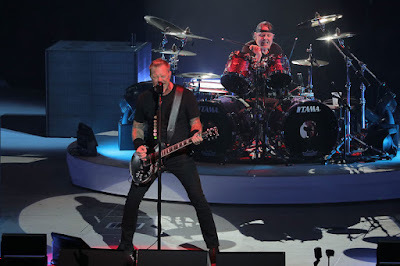 Metallica performed their 1997 classic, “The Memory Remains”, at the Hartwall Arena in Helsinki, Finland on May 9, and the band are sharing professional footage from the event. The May 9 stop in Helsinki was the first of two dates in the city, as Metallica prepared to wrap up their arena tour of Europe with another show at the same venue on May 11. The concert also featured a guest appearance by former Hanoi Rocks singer and Finnish rock legend Michael Monroe, who joined bassist Robert Trujillo and guitarist Kirk Hammett for a performance of his 1989 single, “Dead, Jail Or Rock 'N' Roll."